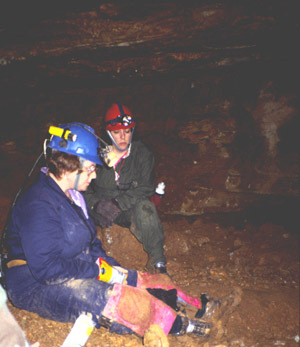 Caving Safely means caving in a manner which protects cavers from accident or injury and protects the cave from damage from cavers. This involves having the proper, working equipment, being in physical shape and having the knowledge to move through the cave, as well as knowing what not to bring, or what not to do. This is just a short checklist of things which a caver should have, know, and do in order to cave safely. It is not comprehensive, and can be added to. Sturdy, durable, fast drying clothes suitable for cave temperature. Boots, with ankle support, and deep lugs for traction. Helmet. More than a bump cap. Should be a rockclimber's helmet, or certified fiberglass model. Chinstrap is preferred. You only have one brain. Take care of it. Pocket first aid kit. Roll of tape and gauze, analgesic, strong surgical type disinfectant, notepaper & pencil. A more extensive first aid kit should be carried on long trips, or kept nearby (such as in a vehicle) for short ones. Food, in amount appropriate for the trip, at minimum candy bar or hi-energy bar. Water for drinking and filling carbides, if carbides are used. Wool or synthetic hat, plastic trashbags for emergency wearing. Emergency phone numbers in helmet. Repair kit for equipment, spare batteries and bulbs for lights. Cave map, if there is one. Have Permission to Enter the Cave. If you don't you are liable for trespass, and may get the cave closed to yourself and others in the future. Know the People You are Going With. Knowing the abilities and limits of yourself and your group can make the difference between a good time and a disaster. Never cave with less than three people in a party. Make sure someone on the outside knows where you are going, when you are expected to be back, and what to do if you don't show up within a specified time. Know the cave, and its hazards. Run through what-if scenarios before trouble strikes. Make sure your equipment is in good shape. Fix it, or make it new before you get to the cave. Make sure the people you take caving are careful cavers, and will respect and not harm the cave before you allow them to go with you. Don't cave with known cave vandals or thrill- seekers. Don't run or jump in a cave. Don't climb a rope hand over hand. Use ascenders and rappel devices which you have practiced with aboveground, first. Don't use a flashlight as your primary light source. Don't break or remove cave deposits or injure or harrass cave life. Don't mark on, or permanently deface a cave wall. Don't dump spent carbide, in or out of a cave. It will kill animals. Don't show off, or deliberately pull dumb stunts underground. 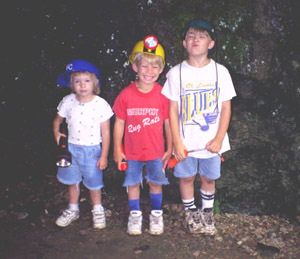 Become an experienced, helpful and considerate caver. Exercise the NSS motto: "Take nothing but pictures, leave nothing but footprints along the beaten trail, kill nothing but time. You'll be a better caver for it.